The MonkMartyr Makarii of Kanevsk lived in the XVII Century. This was a most terrible of times for Orthodox Christians in western Rus'. The vital effort, made by the monkmartyr, was an effort of defence of the Orthodox Faith under conditions of inequitably exhaustive struggle, when it was possible only to defend the future of the Russian Orthodox Church, which was preserved from the brusque passing of the hurricane of the Unia, endured together with Tatar incursions. The holy MonkMartyr Makarii was born in 1605 in the city of Ovrucha in Volynia – into the illustrious Tokarevsky family, reknown adherents of Orthodoxy. In the years between 1614-1620 the saint studied at the Ovruchsk Dormition (Uspenie) monastery, and upon the death of his parents he became a monk at this monastery, having begun his service in the minor monastic rank of novice. In 1625 the Monk Makarii, with the blessing of the archimandrite, left the Uspensk monastery and was sent to the Pinsk bishop, – Avramii, who assigned him to the Pinsk Kupyatichsk monastery. In 1630 he was ordained to the dignity of monk-deacon, and in 1632 – to the dignity of priest-monk. Fame about the excellence of the monastic life of the priest-monk Makarii spread beyond the bounds of the Kupyatichsk monastery, and in 1637 the brethren of the Bretsk Simonovsk monastery turned with a request to the hegumen of the Kupyatichsk monastery – Ilarion (Denisevich), to send them Saint Makarii to be their head. But the Kupyatichsk hegumen also had need of the priest-monk Makarii. In 1637 the head of the Kupyatichsk monastery sent him to the Kiev metropolitan Peter Moghila to hand over money collected by the brethren for the rebuilding of the Kiev Sophia temple, and for the solicitation of help for the construction and repair of damaged monastery churches. Seeing in the priest-monk Makarii a talented son of God's Church, the metropolitan issued him an universal certificate for the collection of offerings, and in 1638 appointed him head of the Kamenetsk Resurrection (Voskresenie) monastery (in Grodnensk district). Until the pillaging and seizing of the monastery by the Uniates in 1642, the Monk Makarii guided the brethren of the Voskresensk monastery. In these harsh times the brethren of the Kupyatichsk monastery summoned as hegumen the Monk Makarii, who held the monastery until 1656. From 1656 through 1659 the Monk Makarii headed the Pinsk monastery, and from 1660 in the dignity of archimandrite the Monk Makarii guided the brethren of his original Ovruchsk Uspenie monastery. More than ten years passed in incessant struggle with the Latino-Polish in Ovrucha. But neither the tearing-away by the Dominicans of the farm-lands belonging to the monastery, nor the rapacious pillaging of moveable property, nor thrashing, – nothing was able to compel the brethren to quit the monastery. Only in the year 1671, after the devastation of Ovrucha by the Tatars, did the holy archimandrite Makarii leave the monastery, in which there remained not a single monk, and he set off for spiritual deeds to the Kievo-Pechersk Lavra. But the defenders of Orthodoxy, like the Monk Makarii, were needed not only at Kiev, but even moreso outside of Kiev. Metropolitan Joseph (Neliubovich-Tukal'sky) assigned Archimandrite Makarii as head of the Kanevsk monastery. Thus, after thirty years of struggle with the Uniates, the Monk Makarii was again on the front lines of giving battle for the Orthodox Faith. In 1672 at the Kanevsk monastery the son of Bogdan Khmel'nitsky, – Yuri, sought shelter. The hetman Doroshenko, having petitioned Metropolitan Joseph for the assignment of the Monk Makarii, repeatedly visited Kanevsk monastery and in 1675 switched to Russian allegiance, having renounced allegiance to the Turks, evidently, not without counsel from the Monk Makarii. In response the Turkish powers dispatched an army to Little Russia. On 4 September 1678 the aggressors rushed on the monastery. Saint Makarii met the enemy with cross in hand at the entrance to the church. The Turks demanded from the monk to hand over to them the monastery treasury. Hearing the answer of the monk, that his treasure was in Heaven, the furious robbers hung the saint hand and foot between two posts. After two days they beheaded the monkmartyr (+ 7 September 1678). Witnesses to the martyr's death of Archimandrite Makarii carried his body to the monastery church, in which for safety they were hidden. But the returning Turks placed firewood around the church and burnt everything concealed in the temple. When the citizens of Kanev that survived began removing the bodies of those that perished, then only one body was found whole and as though alive – this was the body of the MonkMartyr Makarii, attired in hairshirt, with a cross on the breast and another cross in the hand. The holy body was buried in this temple beneathe the altar on 8 September 1678. 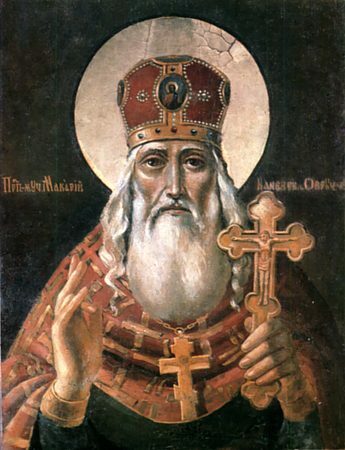 The holy MonkMartyr Makarii was a man of highly righteous and spiritual life, glorified while still alive by miracles and the gift of perspicacity. At Kanev he healed the blind and the dying. In 1688, during renovation of the temple, the grave of the monkmartyr was opened and in it was found the undecayed body of the saint. In connection with the danger of invasion for the Kanevsk monastery, on 13 May 1688 the holy relics were solemnly transferred to the Pereyaslavl' regimental Resurrection church. There also they transferred the beloved book of the monkmartyr – "Discourse of John Chrysostom on the 14th Epistle of the holy Apostle Paul" (Kiev edition 1621-1623) with his signature on one of the page-leafs. Under Bishop Zakharii (Kornilovich) the relics were transferred in 1713 to a new-built temple of the Pereyaslavl' Mikhailovsk monastery, and after its closing the relics reposed from 4 August 1786 at the Pereyaslavl' Resurrection monastery. In 1942 the relics were transferred to the Trinity church in the city of Cherkassa, and from 1965 they are situated in a temple in honour of the Nativity of the MostHoly Mother of God in that same city. The commemoration of the MonkMartyr Makarii is made twice: 7 September – on the day of repose, and on 13 May – on the day of transfer of the holy relics.